So here we are to discuss our various initiatives. We are set to go. After rounds of gruellingly long introductions by the moderator which made the whole affair seem like a live performative reading of the “About” page of websites and artists bios, we run out of time. I was disappointed to say the least. I have been invited one time too many to this kind of panel discussions, that these days I carefully weigh my decision to attend any. I do not believe in the idea of boycott as a viable method of resistance – you cannot criticise what you do not know – unless you have been there, done that several times, in which case it is justifiable to quickly decline a panel discussion that reeks of yet another cosmetic display of Africans in a backdrop of Europeans. I accepted to be part of the panel, because I thought it would afford the opportunity to discuss the various tenets of our motivations, to inform and dialogue with the audience on how, through the incredible work we do as individuals inspired by African realities, we contribute to a new knowledge which displaces the arrant ignorance plaguing the world today with regard to Africa. This did not happen. However, in the course of the event, some of the panelists managed to squeeze in few comments about their positions vis a vis artistic processes and the African art industry. Of special attention was a comment that implored African artists and art practitioners to do away with the insecurities of “looking up to” and collaborating with Western institutions. If the panel discussion turned out as I envisaged, I am almost certain that it would not have been too long before the divergence of our respective ideologies revealed itself. I for one, would have had something to say about this proposition. My response would have been something like this: The so-called insecurity of Africans when it comes to dealing with Western institutions is by all means well founded. On the contrary, it is exactly because we were not insecure enough, that was why slavery and colonialism happened. This is equally why neocolonialism met no real opposition. In order to expand on my point, let’s take a brief look at neocolonialism which, by accessible knowledge, is a byproduct of that agelong ambiguous relationship between coloniser and colonised. It is a side effect of the colonised (in this case, Africans) rising up to the task of regaining agency from the coloniser. A side effect because the expected healthy outcome behind this uprising is to displace the coloniser but not to replace him by stepping into his colonial position. But was it a mere stepping into the coloniser’s place, things would probably not have been this deplorable. It extends to the colonised becoming a stooge, a conduit, a comprador, by which the coloniser continues to maintain and tighten – albeit indirectly – his colonial grip. And how did this come to be? I would argue that it became possible because in the relationship between the coloniser and the colonised, the emphasis was never on the terms of exchange but rather on the short term gains for the often astute, go-getter colonised, so fortunate to stand out in the eyes of the coloniser. Astute, but short-sighted. This short-sightedness is the blindspot of the colonised who would eventually transform into a neocolonialist. There were the likes of Kwame Nkrumah, Patrice Lumumba, Thomas Sankara, Amilcar Lopes Cabral – figureheads of true African nationalism and independence, so much that I am tempted to paraphrase one of Amilcar’s proclamations: “our struggle is not measured by the number of fallen soldiers, but by the number of new lives made possible for every territory of Guinea Bissau reclaimed from the Portuguese”. For him, independence was only a means to a far-sighted end. This mindset guided his determination and discipline in galvanising a revolutionary struggle. And while he was assassinated (something he shares in common with everyone mentioned above) before his country became independent, no one today can fault, with reasonable argument, the fact that his position laid the foundation for Guinea Bissau’s independence. In the same light, we know of many African nationalists, activists and agitators who turned out to be phoney. They dined and laid with the colonisers so much that whatever genuine intentions they had were attenuated and blurred by the short-term and power-inducing benefits of this relationship. They continuously drank from the well of forgetfulness, one prepared solely for the induction of amnesia. They gladly accepted the gun powder and glittering mirrors dangled at them in exchange for lands and all the resources underneath them, without stopping to think of the value of such gun powder or mirrors in years to come. They were distracted by their own appearances in the mirror, giving no thought to the temporality of a mirror image. Taking the above as a litmus, we immediately see what stands out when we compare many African nationalists of the days of African independence. It is not far-fetched to apply same comparison to artists and cultural operators of today split between Africa and the Diaspora, who are agents of cultural exchange and merchandise, engaged in the repackaging and exportation of an idea of Africa. In centuries past, Africa has undergone series of invasions and reinventions – first by Asians, then Arabs and Europeans (it is therefore preposterous to talk of a singular notion of Africa). Today, it seems that, by a turn of events mostly propelled by the spread of capitalism riding on the rails of globalisation (which in turn only means a nationalistic approach towards multiculturalism, where the mechanisms of border control are designed to sift out (and discard) the human element from the resources and benefits that come with it), the beam is sharply focused on Africa. Two decades into the 21st century, we are almost certain this is Africa’s century. It has fallen in the hands of Africans themselves, more than any other time in her history, to reinvent – or at least play the major role in the reinvention of – Africa. In the face of such wondrous opportunities, a special time, so to speak, for Africa and by extension those of African origins, it would be myopic to think of this sudden ‘love’ for Africa and her culture oozing from the Occident and Asia as unconditional. 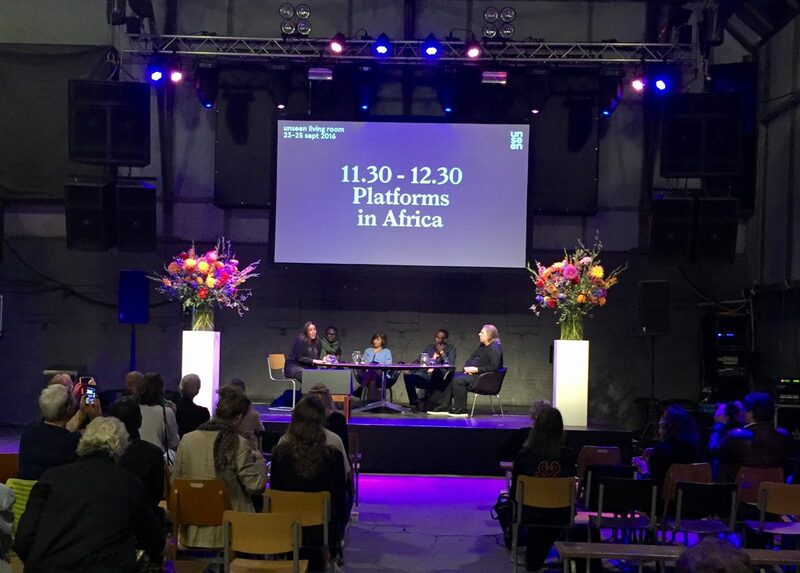 In other words, sitting in a panel in 2016, of well meaning African intellectuals and cultural operators, where one of them makes a comment – almost in a contrite tone – calling on Africans to do away with “insecurities” when it comes to dealing with the West, is to me not only outrageous but exemplary of how much a few amongst the best of us are willing to settle for temporary benefits and political correctness at the expense of posterity. That which is called insecurity is the least severe of the most likely reactions to many centuries of exploitation, which by all evidence is about to be intensified, judging by the alarming rate at which borders of marginalisation and ostracisation are being erected, fuelled by religious extremism and right wing politics across the globe. For those of us caught in the middle of this bipolarity, we must negotiate our coordinates carefully while making sure we keep our joints and moving parts in constant motion – movement is imperative. Therefore, there will always be exchange between peoples of this world (and more so between Africa and Europe because they are the closest of continental neighbours). It is a universal phenomenon. However, a more thoughtful and far-sighted position would be to place the emphasis on the terms of exchange and collaboration rather than on whether Africans have to be on guard or not – by all means, they must. In order not to jump ahead of ourselves, it is first and foremost important to recognise and articulate what our values are. And a lot of us do so today, through the arts – amongst which are also found those knowingly and unknowingly roped into being complicit in the re-selling out of Africa. They sell out Africa because they are insecure about the future of the continent. They accept deals that are only good in appearance, but which hold no durable value. They sell out because they believe they are being proactive by carving out a place for themselves in the mainstream. They sell out because all they aspire to is that one Occidental dream transmitted across radio and television all of their lives. They sell out because they are the new Africans, armed with the mantra “Africa is an idea, and only a thing of the mind”. They sell out because they refused to confront history, and therefore hardly “escape its conditioning”. Panelists of “Platforms for Africa” seated and ready for commencement. From left to right: Touria El Glaoui CEO of 1:54 Art Fair and moderator of the discussion, Emeka Okereke artist and director of Invisible Borders Trans-African Project, Olfa Feki – Independent curator, Azu Nwabuogu – Director of Lagos Photo Festival and Mark Coetzee, Executive Director Seitz MOCAA. Amsterdam, September 2016.